High-quality olive oil extracted from the silver-green olive groves of Crete is incorporated in this cosmetic line. 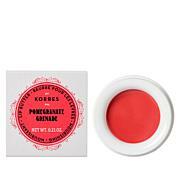 Soft, buttery formulas provide hydration and help fight free radical aggressors on and around the lip area. Ingredients: Ricinus Communis Seed Oil/Ricinus Communis (Castor) Seed Oil, Candelilla Cera/Euphorbia Cerifera (Candelilla) Wax/Cire De Candelilla, Simmondsia Chinensis Seed Oil/Simmondsia Chinensis (Jojoba) Seed Oil, Cera Alba/Beeswax/Cire D'abeille, Aroma/Flavor, Butyrospermum Parkii Butter/Butyrospermum Parkii (Shea) Butter, Corylus Avellana Seed Oil/Corylus Avellana (Hazel) Seed Oil, Macadamia Ternifolia Seed Oil, Ethylene Brassylate, Copernicia Cerifera Cera/Copernicia Cerifera (Carnauba) Wax/Cire De Carnauba, Octyldodecanol, Tocopheryl Acetate, Glycerin, Irvingia Gabonensis Kernel Butter, Aqua/Water/Eau, Hydrogenated Coco-Glycerides, Olea Europaea Fruit Oil/Olea Europaea (Olive) Fruit Oil, CI 77891/Titanium Dioxide, Helianthus Annuus Seed Oil/Helianthus Annuus (Sunflower) Seed Oil, Olea Europaea Leaf Extract/Olea Europaea (Olive) Leaf Extract, Phenoxyethanol, Potassium Sorbate, Sodium Benzoate, Lactic Acid, Aloe Barbadensis Leaf Extract, Tocopherol. Ingredients: Ricinus Communis Seed Oil/Ricinus Communis (Castor) Seed Oil, Candelilla Cera/Euphorbia Cerifera (Candelilla) Wax/Cire De Candelilla, Simmondsia Chinensis Seed Oil/Simmondsia Chinensis (Jojoba) Seed Oil, Cera Alba/Beeswax/Cire D'abeille, Butyrospermum Parkii Butter/Butyrospermum Parkii (Shea) Butter, Corylus Avellana Seed Oil/Corylus Avellana (Hazel) Seed Oil, Macadamia Ternifolia Seed Oil, Ethylene Brassylate, Copernicia Cerifera Cera/Copernicia Cerifera (Carnauba) Wax/Cire De Carnauba, Octyldodecanol, Parfum/Fragrance, CI 77891/Titanium Dioxide, Tocopheryl Acetate, Glycerin, Irvingia Gabonensis Kernel Butter, Aqua/Water/Eau, Hydrogenated Coco-Glycerides, Olea Europaea Fruit Oil/Olea Europaea (Olive) Fruit Oil, Helianthus Annuus Seed Oil/Helianthus Annuus (Sunflower) Seed Oil, CI 15985/Yellow 6 Lake, Olea Europaea Leaf Extract/Olea Europaea (Olive) Leaf Extract, CI 15850/Red 7 Lake, CI 77492/Iron Oxides, Phenoxyethanol, Potassium Sorbate, Sodium Benzoate, Lactic Acid, Aloe Barbadensis Leaf Extract, Tocopherol. 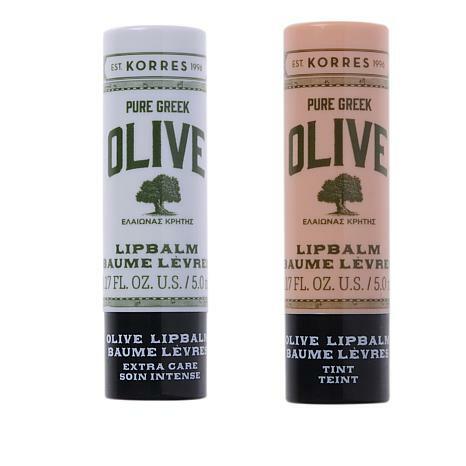 Love's me some Korres and I love this lip balm duo. Don't understand all the complaints, this is prestige lip care after all with natural ingredients. Balms are very hydrating, soothing, soaks in immediately, I love the natural fragrance, and you don't have to keep reapplying. 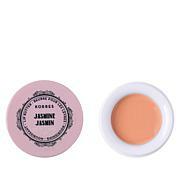 The tint is a very light sheer and looks very natural. Love the packaging. Next I'm ordering the Lip Oil that always sells out. 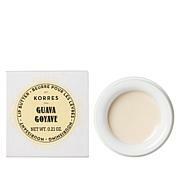 Thanks Liz, Korres, and HSN! Very sheer, not heavy feeling. Light fresh smell. They definitely do the job. 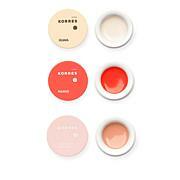 These lip balms are very moisturizing without being waxy or greasy.